This past Sunday I took a trip into Cameron Falls for an evening shoot.The sky was clear and blue with no cloud cover.The wind was brisk and cool but we have to remember it is still March.The water levels were quite low and there were lots of pools. A trio of Hooded Mergansers flew in to the open water below the falls. It was fun to watch the males chase after one another in there attempts to court the female. 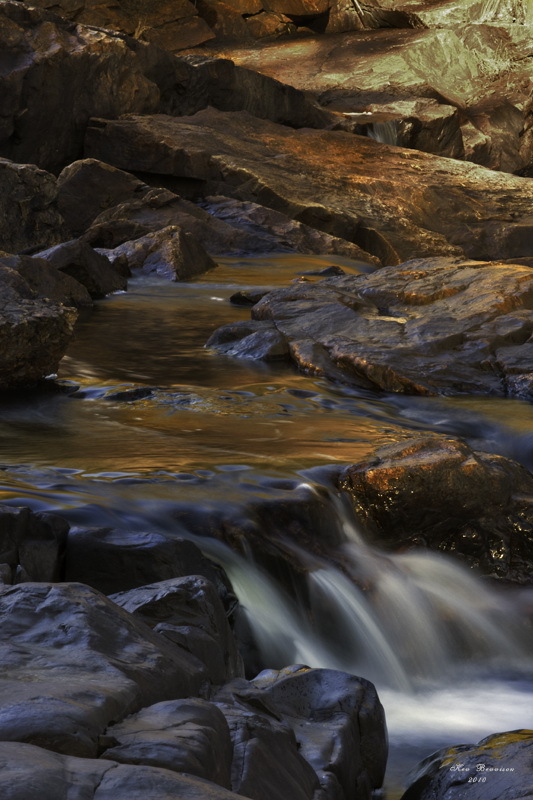 With blue from the sky,copper from the rocks,gold from the evergreens reflecting into the pools and the low light filtering through the trees onto the rocks in the top right hand corner I created this colorful scene. I set my 28-135 zoom @ 80mm and the shutter speed at 1 sec,F22.Using the black rocks for fore ground I set this shot up.